With high speed this and WiFi that, it’s hard to escape, unplug and unwind. Technology and a twitter pace have made their way up to the mountains too. Detachable lifts and handheld devices have brought suburbia to what was once a serene sport of skiing. Do you ever wish you could get away from the modern mayhem and just glide down a quiet snow covered trail? In our family travels, we have found a few New England ski areas where time travels at a slower, gentler rate. It’s refreshing to pull up to a ski area without valet parking or shuttle buses from parking lot E. Imagine, no rows of ATM-style ticket kiosks, no lesson assembly lines, or Disney-style lift corrals with electronic ticket checks. Here are a few ski resorts that hearken back to a simpler time when skiing was a hardy sport with a human touch, and base lodges were a place to fraternize by a stone fireplace (not check your facebook). 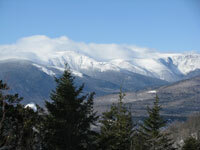 See our Top New England Ski Towns for Family Vacation as well. 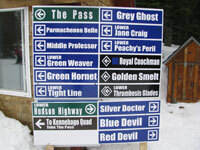 trail features, although there is a modicum of snowmaking. Black is not too different than it was in 1935 when the first overhead cable lift in the country was installed here, the scenery is unchanged and unbelievable too. With just enough steeps, glades and winding trails to keep a family amused for a day or two, Black is a bargain at $29 midweek and $39 weekends ($20 and $25 for kids). Make a family weekend out of it by staying in charming Jackson, or North Conway to broaden your lodging choices. 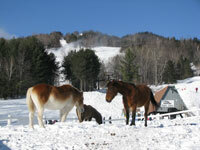 Saddleback (currently closed and awaiting new investment and ow nership) takes you back in Saddleback Mainetime. Our winter weekend in this neck of Maine woods was such a treat from our usual high speed laps on groomed wide boulevards. Arriving at Saddleback, you park a snowball’s toss from the slopes and walk to a welcoming post and beam base lodge (which is actually new but has a classic homey atmosphere). Ticket prices were a flashback at $49 a day, every day. Saddleback’s terrain is certainly worthy of higher rates, 2,000’ vertical on a 4,120’ summit, but that’s part of the humility and success of this Maine-family owned spot. SaddlebackWhen is the last time you skied a two-mile long top to bottom run with twists and turns undulating along the natural contours of the mountain, not another skier in sight? That’s Saddleback for you. 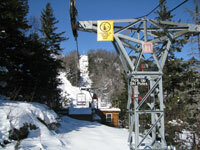 Fixed grip chairlifts keep a slow but steady pace, spreading skiers and riders out over 66 trails and glades. 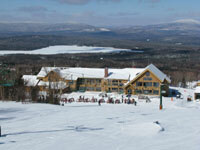 Saddleback offers big mountain skiing without the big crowds – given its remote location in beautiful Rangeley, Maine. Apres ski we met amiable locals at the Swig and Smelt, while our kids went sledding outside the mountainside condo we rented for the weekend. We’ll be back to Saddleback. Bolton Valley and Burke Mountain come to mind. Both offer substantial ski terrain, 1,700’ and 2,011’ vertical respectively served by quad chairlifts, with ski in/ ski out lodging or quaint local inns. So while these ski areas aren’t entirely “retro” like Mad River and Magic, they are less-visited than Vermont’s major ski resorts. Bolton has 71 trails, many with extraordinary views of Lake Champlain and New York ’s Adirondacks beyond. Burke’s setting in the Northeast Kingdom is spectacular, and Burke Academy’s history of producing 45 Olympians on these slopes is equally impressive. Magic also offers old school skiing in a homey humble environment, tight twisty tr ails, natural snow and old fixed grip double chair s- the base lodge is a tribute to alpine history and it rocks après ski with locals and loyal families. Mad River Glen in Vermont has a single chair – is that retro enough for you? Mad River also doesn’t allow snowboarder on its natural snow trails. General Starks Pub is classic old school après ski in the venerable base lodge. Mad River Glen’s mantra rings true – “ski it if you can”.